If you’re looking for a slower pace of life and a place where you can discover secret little coves and beaches that feel like they are just that – secret – then look no further than Cornwall, the south west corner of the UK that is full of surprises. Venture all the way down to the UK’s most southerly tip, the Lizard Peninsula and you’ll reap the rewards as its beauty is outstanding. Its waters are turquoise and there’s every landscape from jagged dramatic cliff tops to sub-tropical plants and palm trees. Get out on its waters and catch your own dinner on a sea fishing trip or go diving and explore the area’s rich history of sunken shipwrecks. Kynance Cove might draw the crowds, but try the more secluded Polurrian Cove near the fishing village of Mullion (which is well worth a potter for its galleries, cafes and craft shops). Or try locals’ favourite St. Anthony; it’s protected by the Helford Voluntary Marine Conservation Group and is a breeding ground for shrimp, crab and sea horses, as well as wading birds and herons. Give Gunwalloe Village a visit too, which sits among the sand dunes and cliffs of the Lizard’s west coast. There are several cottages to chose from down in this beautiful corner of Cornwall; take a look at this gorgeous large Farmhouse down at Kestle Barton or if it’s a cosy hideaway for 2 you’re looking for then Howthere Barn is ideal. There are countless beaches to chose from in Cornwall, however a select few are lesser known and therefore quieter. Porthgwidden Beach – Visitors to St Ives often head straight for Porthminster and the surfer’s paradise of Porthmeor, but between the two is the smallest beach of them all – Porthgwidden. Accessed by a narrow walkway past the former fisherman’s houses, it’s an east-facing sun trap, perfect for families and overlooked by rocky crags on both sides. Pentire Steps – At the far end of one of Cornwall’s best known beaches is this little known sandy cove. Pentire Steps is the next cove around from the famous Bedruthan Steps. Unlike Bedruthan you won’t find a car park full of cars, a cafe and scores of people dotted around the expanse of beach. What you will find is a beautiful, secluded golden sand cove backed by high cliffs. 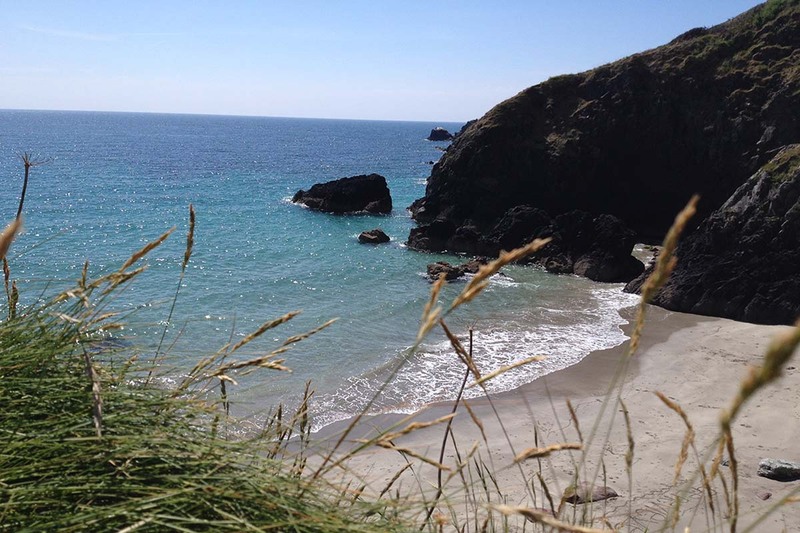 Bosahan Cove – Bosahan is not like your usual Cornish beach. For a start it is surrounded by dense woodland. And there is very little in the way of surf here, but then it is on the banks of a river. This lovely little beach is on the southern shore of the Helford river and is over a mile’s walk from the nearest parking spot. As well as making for an enchanting woodland walk to get to the cove, this also ensures the beach is quiet at all times. The Gem, Pentire and Tregenna Cottage, St Ives make for quieter retreats near these secret beaches. The spectacular landscape of Rinsey Cove between Porthleven and Praa Sands is a hidden treasure well worth seeing. The cove is in the shadow of a former tin mine engine house; Wheal Prosper which ceased production in 1865, but still stands and provides a dramatic backdrop to the ocean below. The area is steeped in history with tales of smuggling and shipwrecks forming part and parcel of Cornish charm and culture. The steep winding footpath down to Rinsey Cove is well worth the trek though it is not for the faint-hearted. But the spectacular views awaiting you are well worth the effort. With many stunning gardens to chose from in Cornwall this one is tucked away and is where small really is beautiful. The intimate three acres includes a Mediterranean area, iris garden and hot border which boasts a centerpiece of scorching colours in the summer. There are of course secret little places to discover in Cornwall that serve wonderful food and drink to suit all tastes. The Hidden Hut – is exactly how it sounds, serving simple beach-side refreshments by day and hosting extravagant open-air feast nights on select evenings on Porthcurnick Beach. South Cafe – Located in Manaccan near Helford Village, this hidden gem serves gorgeous lunches and dinners, plus wonderful coffee and cakes. Schooners – a beach-side restaurant in St Agnes serving big-flavour small-plates with quite possibly the best views from any restaurant in Cornwall. With so much on offer in Cornwall there is little room for excuses. Why wait? Book a Cornish holiday today and discover your very own secret Cornwall.